Javid Gamzatov reached the final of the international qualifying tournament in Mongolia in Greco-Roman wrestling, won a license for Olympic games for the national team of Belarus in the weight class up to 85 kg. 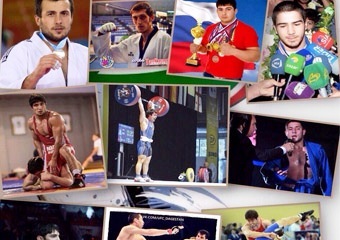 The natives of Akhty, Allahyarov Anwar and Allahyar January, representing Moscow, have become winners of the championship of Russia among the 1999-2000 in Greco-Roman wrestling. The Open Championship of Tula region in freestyle wrestling among men took place on April 13 in Shchekino. LezgiSport.com reports that teams from Kaluga, Orel, Mtsensk, Bryansk, Tula, Shchekino, Plavsk and others attended at the tournament. Gadzhimet Ferzaliev became a champion in the weight class up to 70 kg. Maxim Kaflanov won the championship of the Volga Federal District (VFD) in freestyle wrestling in the weight category up to 125 kg and made the cut in the championship of Russia - reports LezgiSport.com. Rukhin Mikayilov won the bronze medal of the European championship among youth under 23 years of age. The first day of European Championship in Greco-Roman wrestling among young people up to 23 years taking place in Ruse Bulgaria has come to an end.